September 11, 2017 September 10, 2017 / Elizabeth T.
There may be an unspoken “rule” about not wearing white after Labor Day, but I truly believe this is such an outdated fashion guideline, especially in sunny Los Angeles! When the early weeks of “pre-autumn” still very much feel like summer, it’s safe to say that no one’s really embracing “sweater weather” in California just yet! And as we near the end of summer, I’m in no rush to rock my fall wardrobe because I like to give my summer dresses one last good wear. If you’ve been following my blog for awhile now, then you know how much I’m obsessed with white dresses (as you can here and here)! They’re definitely my favorite summertime pieces because they emulate that free-spirited, bohemian chic lifestyle vibe that’s the epitome of a lazy California summer afternoon. Though I’ve always associated Abercrombie & Fitch with a preppier, East Coast boarding school school style and Hollister as its more relaxed, bohemian West Coast counterpart, I’ve recently been obsessed with this midi dress from A&F because it seems perfect for the end of summer in LA, don’t you think? 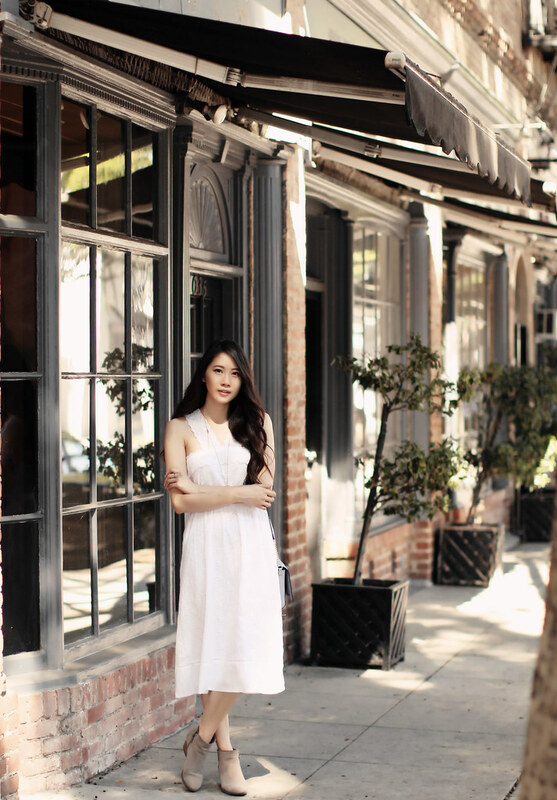 Made from the softest cotton with an eyelet fabric, this dress is pretty yet simple, with bohemian vibes that are just perfect for a lazy California summer afternoon. **I received this complimentary dress from Abercrombie & Fitch . All opinions are my own. 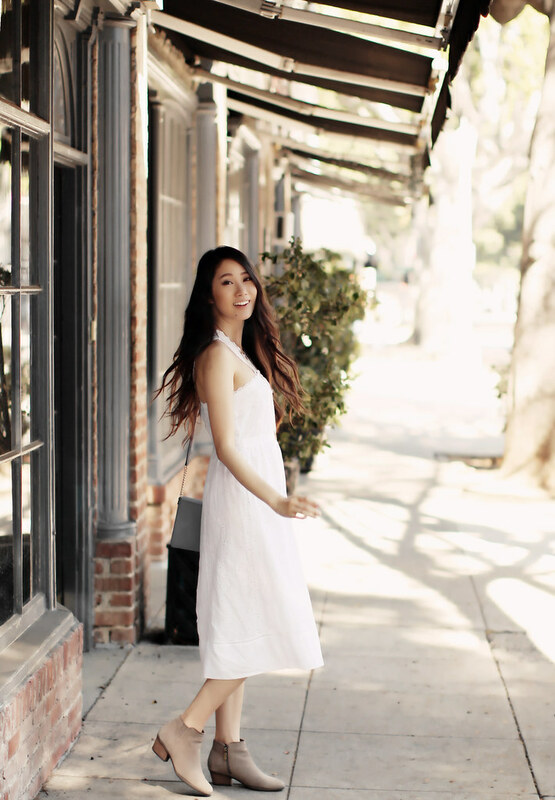 Thank you A&F for sponsoring this dress for this beautiful shoot! Such a romantic dress! I love white for this time of year! white looks absolutely amazing on you!! Gorgeous dress! I love that you matched it with a pair of booties for some fall vibes! You look absolutely stunning doll! 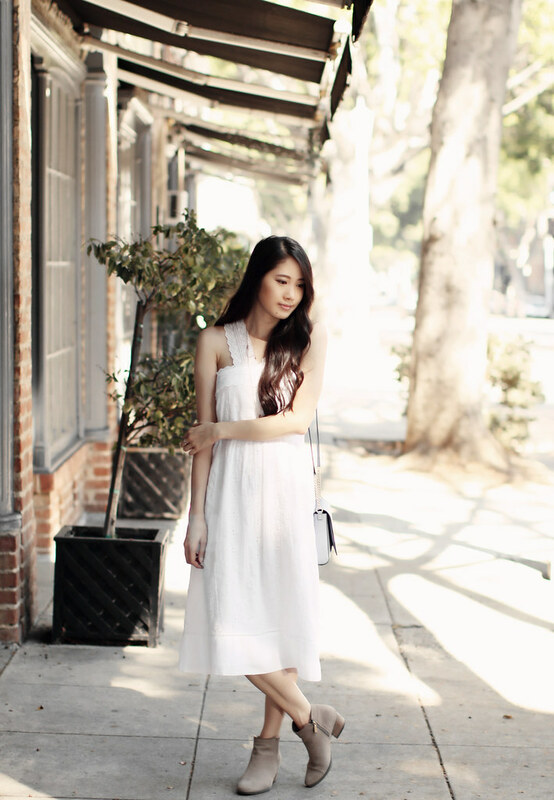 You look so lovely in this summer white dress dear. I’m always obsessed with wearing white dresses as well.. it’s like a closet essential for me and I much prefer a white dress over a black dress. Girl, you look incredible in this outfit! I love wearing white and the cardigan is just perfect! Aww thank you os much love ❤ 🙂 You're too sweet! Glad you liked this outfit! Gorgeous looks and awesome style. You look stunning. It’s a beautiful dress! That’s a perfect dress of the west coast! Thank you so much love ❤ 🙂 And yes, it definitely is perfect! White is pretty and suits you well. Yes, me too! 🙂 ❤ White is so amazing, timeless, and classic, and I'd honestly wear it year round! You look so fresh in this white dress. Something i would wear too. That dress is the dream dress for the summer! I’ve never been able to find one so pretty, and you with your long hair paired with the dress makes it all look so ethereal. Aww you’re too sweet and kind! 🙂 I’m glad you like this look! And yes, white dresses aren’t necessarily hard to find, but it can sometimes be difficult to find one that gives off the right vibe! ❤ Thank you so much for stopping by love! Such a pretty dress! I love how you styled it with these booties! That dress is so cute, you look so pretty! The dress and cardigan go super well together! Such a pretty dress, so perfect for Spring or Autumn! Love the white dress, so classic and pretty!